The purpose of this publication is to provide navigators and astronomers with simple and efficient methods for calculating the positions of the Sun, Moon, navigational planets and stars over several years to a consistent precision with the aid of a pocket calculator, personal computer or laptop. The software package NavPac runs on an IBM PC or compatible, and enables navigators to compute their position at sea. Its manual is included on the CD-RoM which also includes part of the Royal Navy's Admiralty Manual of Navigation (Volume 2). The package contains features additional to the book, e.g. calculating great circle and rhumb line tracks. There are also functions for calculating rise and set times of celestial objects and determining the altitude and azimuths of navigational objects. NavPac is used world-wide by the Royal Navy, other navies and by navigators who require an independent means of navigation. NavPac has also been accepted by the UK Government as a permitted system for naval certificates of competancy under STCW 95 (Standards of Training, Certification and Watchkeeping). The tables and coefficients and the algorithm for determining position at sea from observations made with a marine sextant have been used by navigators since 1981. NavPac v3.4.0 is supplied with NavPac and Compact Data 2016-2020. Additional astronomical data files are stored on the CD-RoM, which can be read into any personal computer. Astronomers, navigators, surveyors and general users will find these data files ideal for making astronomical calculations where positions of the Sun, Moon, planets and bright stars are required. 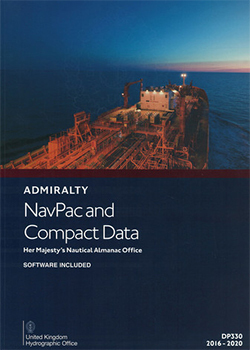 "NAVPAC provides astronomical data and is a fast, reliable, authoritative method of solving Spherical Great Circle, Spheroidal Rhumb Line and astro-navigation calculations ... NAVPAC is in Royal Navy service and is the Royal Navy's preferred method for obtaining astronomical data and solving the above calculations". Para.201, BR45(1) — Admiralty Manual of Navigation, Volume 1 (10th edition). September 12th 2017: On page 11 in the expression for D, the number of days since 2016 January 0, the constant term 737439 should be replaced by 736373. In the example at the foot of page 11, the expression for determining D is correct. You can purchase your copy from Admiralty Paper Distributors.